After more than three decades of researching and writing on themes of mankind’s inclination to abuse and harm our fellow human beings, I rarely receive something so shocking I have difficulty to write about it. A recent decision of the United States Government’s Food and Drug Administration (FDA) to permit commercialization of the first-ever GMO animal for human consumption, despite an unprecedented 2 million opposing citizen petitions, and despite opposition of 40 members of Congress, more than 300 environmental, consumer, health and animal welfare organizations, salmon and fishing groups and even supermarket chains, is such an instance. It astonishes me. On November 19, 2015 the FDA approved the commercialization of a genetically modified animal for the first time anywhere in the world. 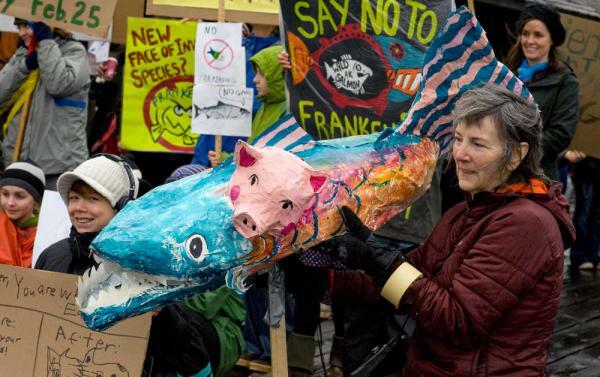 Hello, GMO salmon! Welcome ladies and gentlemen to the House of Frankenstein. Please read on, as you likely will not believe the level of malicious insanity at President Obama’s FDA today. The original House of Frankenstein Hollywood film of the 1940’s was based on a novel by Mary Wollstonecraft Shelley. It dealt with a fictional human cloning by a scientist, Victor Frankenstein, who makes an experiment in human cloning in which he creates an unexpected monster, cloned with the brain of a convicted murderer. The FDA statement continues, “The FDA has thoroughly analyzed and evaluated the data and information submitted by AquaBounty Technologies regarding AquAdvantage Salmon and determined that they have met the regulatory requirements for approval, including that food from the fish is safe to eat,” said Bernadette Dunham, D.V.M., Ph.D., director of the FDA’s Center for Veterinary Medicine. What is this thing called AquAdvantage Salmon? It’s a genetically modified hybridization between GMO Atlantic salmon (Salmo salar) and closely related wild brown trout (Salmo trutta). The inventors took a growth-hormone gene from the Chinook salmon and a piece of DNA from the brown ocean trout. Both combine to create a fish that grows year-round, allegedly cutting feed costs and the time it takes to reach marketable size. In May, 2013 a group of scientists in Canada published the results of their study of the possible dangers of AquaBounty Technologies’ GMO salmon in the proceedings of the Royal Society of Canada. Their conclusions, were they taken seriously in Washington would have shut the door on FDA approval once and for all. They were totally ignored by the FDA who relied instead on evidence presented them by AquaBounty Technologies. As noted in the official FDA statement, they dismiss the risk of GMO hybrid salmon escaping into nature because of what the FDA claims are stringent controls in the breeding farm the company has in…Panama. To my knowledge, Panama is not especially known for its rigorous animal safety standards. Even if it were, however, the FDA chose to ignore the fact that AquaBounty’s GMO salmon facility in Panama had been repeatedly fined by Panamian authorities for repeated environmental violations. Those included a security lapse that led to ‘lost’ salmon in Panama, and the fact that AquaBounty out-sourced the “strict security” of its main Panama facility to an unknown independent contractor in 2013 to maintain security of the facility and other day-to-day practices. In summer of 2014 the independent contractor died, leaving management of the facility in limbo for weeks, pending signing of a new lease with new operators. 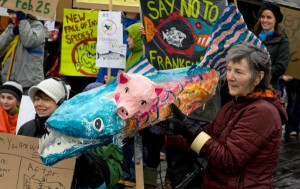 If that were not enough ground to deny the safety claims of AquaBounty, the fact that the company plans to sell its GMO hybrid salmon eggs to fish farmers worldwide, ought to have been grounds to deny license. If the GMO salmon eggs are sold worldwide to salmon farmers, marketed as cost-reducing, fast-growth eggs, the eggs will undoubtedly end up being sold to conventional open net-pens, the standard system for the global salmon aquaculture industry, and, significantly, a form of confinement from which millions of farmed salmon have escaped in the past. The FDA has done a neat trick. The review of GMO hybrid salmon from AquaBounty as well as a row of other such animal GMO applications waiting future FDA approval is being made under the category of “new animal drugs.” (sic!). That allows the FDA to bypass normal substantive input from other agencies—like the National Oceanic and Atmospheric Administration, the National Marine Fisheries Service, the US Fish and Wildlife Service, or the Environmental Protection Agency—that have actual expertise in areas such as fisheries and ecological risk. Because of concerns over trade secrets, the process also mostly takes place in the dark. The reader should decide if the FDA is guilty of simply sloppy procedure or of deliberate malign action. If this decision is allowed to stand, and GMO animal products appear on our supermarket shelves unlabeled, as the FDA has ruled, the future of our food is truly become a House of Frankenstein.